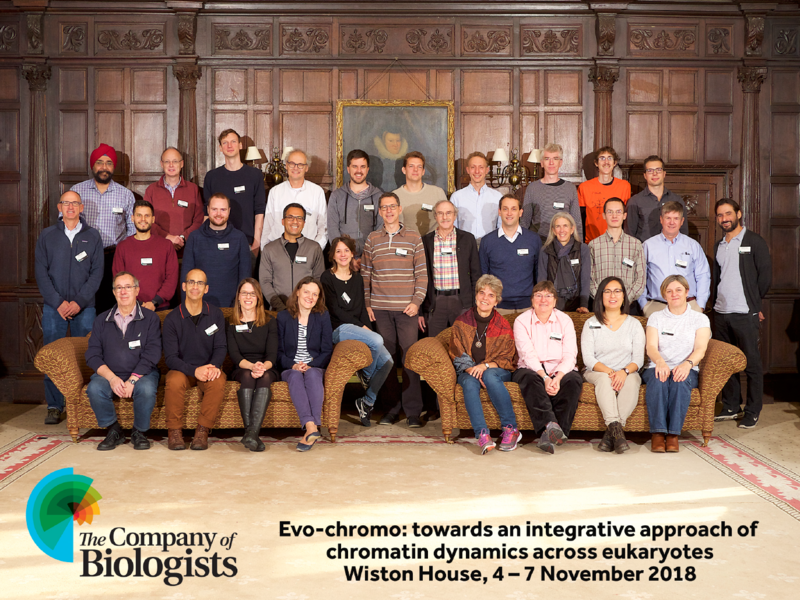 At the beginning of November 2018, thirty researchers congregated at Wiston House to attend a workshop titled ‘Evo-chromo: towards an integrative approach of chromatin dynamics across eukaryotes’. The workshop was organised by Frederic Berger (Gregor Mendel Institute) and Ines Anna Drinnenberg (Institut Curie), and was the 27th workshop hosted by The Company of Biologists since 2010. Its objective was to explore the biology of chromatin – the macromolecular complex of DNA, RNA and protein that makes up chromosomes – in light of evolutionary questions and ideas, particularly those relating to eukaryotic evolution. Chromatin was first observed in the 19th century, when it was visualised by staining chromatin with basic dyes (the term ‘chromatin’ derives from the Greek word khroma meaning ‘colour’). During the molecular biology revolution of the 20th century, chromatin came to sit at the heart of our understanding of gene regulation, cell differentiation and inheritance. As our discussions at the meeting highlighted, the increasing wealth of phylogenetic data, exciting new technologies, and an increasing number of tractable model systems has produced a series of puzzling and pressing evolutionary questions. However, in the excitement and industry of modern molecular biology, these questions often remain skulking in the background. The focus of this meeting was to clarify those questions and bring them to the foreground. Alongside the 20 invited speakers, we were lucky enough to attend as one of 10 early-career researchers (PhD students, postdocs, and young PIs). These places are fully funded by the Company of Biologists, and it was a fantastic opportunity for us to present our work and receive feedback. Alexander is a graduate student in the Henderson Group (University of Cambridge) specialising in plant meiotic recombination, and James is postdoc in the Rentzsch Group (Sars Centre) specialising in cnidarian development and evolution. This was an incredibly valuable opportunity for us to meet world-class scientists and expand our academic network. Furthermore, as we are both planning to move deeper into the world of chromatin biology, it was even more valuable in helping us to better orientate in this research area and gain an understanding of the most pertinent questions in the field. Back row standing: Harmit Malik, Kenneth Wolfe, Peter Andersen, Ulrich Technau, Aidan Maartens, Tobias Wernecke, Simon Elsässer, James Briscoe, Peter Sarkies, Zachary Harvey. Middle row standing: Brandon Gaut, Chema Martin-Duran, James Gahan, Siavash Kurdistani, Frederic Berger, Steven Henikoff, Bob Schmitz, Catherine Peichel, Alexander (Sasha) Blackwell, Douglas Erwin, Bernardo Lemos. The workshop was far from regular. Firstly, we had never attended a meeting that was both so small and so diverse. Talks ranged from genomic imprinting in marsupials, developing biomarkers of human aging, the structure of archaeal nucleosomes, developing quantitative ChIP-seq methods, and the role of genetic conflict in centromere evolution. However, all of these diverse research areas were looked at through the lens of evolutionary biology, with the objective to find commonalities and shared general questions. One consequence of this diversity was that everyone was there to learn and to think, as everybody was to some extent outside of their comfort zone. Secondly, the fact that we were all there to address the issue of chromatin evolution meant that we searched for the common threads and broader significance connecting the talks. This led to a greater examination of the conceptual framework(s) surrounding chromatin biology, and a probing of the limitations and future possibilities. Personally, we found the meeting to be pleasingly free of the ‘look-how-many-RNA-seq-experiments-I-did’ kind of attitude, and the focus was almost exclusively centred on biology and ideas. This was reflected in the large amount of preliminary and unpublished data shown at the meeting. 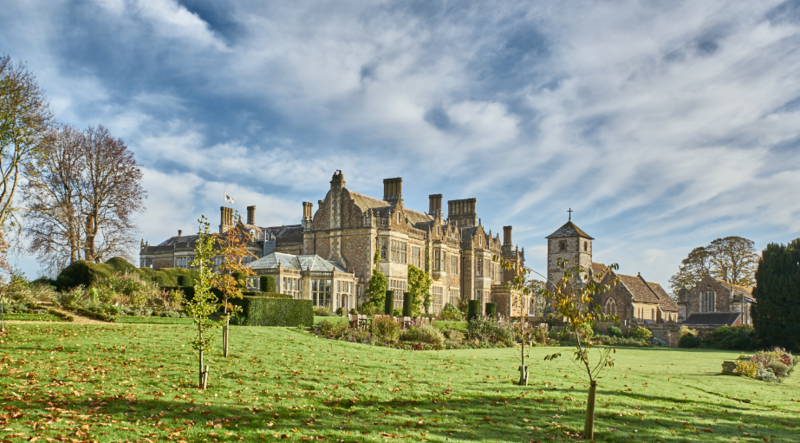 Thirdly, alongside the marvellous attendees, the house itself, located in West Sussex, provided a wonderful context. The 16th century house is situated in the South Downs National Park, and is the location of Wilton Park, a project established in 1946 with the aim of promoting peace and democracy in Europe. It therefore seemed an appropriate setting for the meeting, given the role that international science has played in promoting integration and cooperation in a once fractured world. This couldn’t help but feel more poignant, given the current resurgence of nationalism and the risks this poses to science. Indeed, perhaps the stand out speaker of the meeting was not a scientist but rather a local historian who led us on a captivating historical tour of the house. The small size of the conference, the absence of phone signal and the remote location all encouraged meaningful social interaction. There was a chance to engage with everybody, with no shortage of time for discussion and questions. The organisers aimed to restrict the number of attendees known by each attendee – this had the benefit of promoting interaction, an unpretentious attitude, and removed the usual hierarchies emerging at most more specialised conferences. This lack of hierarchy was further demonstrated by every speaker having equal time. Interaction was stimulated by having a table plan for all of the dinners, which was rearranged each night. Altogether, the quality of organisation and the thought put into every detail was mindboggling. It is our belief that this meeting was a milestone in the development of chromatin biology. From our perspective, a consistent problem is that the worlds of ‘mechanism’ and ‘theory’ rarely interact in meaningful ways; the former either disregarding the latter, or else having a problematically naïve understanding of their concepts, whilst the latter remain behind with experimental advances and have a tendency of gross oversimplification. This meeting was at least a step towards redressing this balance, and felt very much like the beginning of a connection between the two. Hopefully, this will be strengthened by continued meetings and interactions of this kind. As early stage researchers, we left feeling inspired to move deeper into the field of chromatin biology and more than ever convinced that there are huge questions left to be answered. We thoroughly recommend early career researchers to apply to one of these workshops in the future (for a list of upcoming workshops go to http://www.biologists.com/workshops/). If you are interested to read more about the questions discussed and identified during the meeting, please take a look at the forthcoming perspective article – watch this space!